You can go on safari and type in jailbreak me on google, click the first link, and press install. It can be done on your iPad. Can it be done on itouch 4g? Will you get in trouble from apple? It sounds to good to be true…they can’t stop your site.? I would like to download the site. How do you it? And it will work ? All the time..
Can someone please answer my questions? I’m getting an iPod touch 4g (32 gb but i don’t think that matters) and i’m thinking about the advantages and disadvantages of jailbreaking my (soon to be) iPod. Remarkable issues here. I am very happy to look your post. Thanks so much and I’m having a look forward to touch you. Will you kindly drop me a e-mail? According to the recent adjustments made to the DMCA (Digitial Millenium Copyright Act), you are allowed to jailbreak your devices. It is officially legal. It may void the warranty but that is a non issue since you can do a restore through i tunes and apple will never know you JB in the first place. I went to the site, but i can’t install it from there. I’m doing something wrong. Can someone please help me and tell me where i can download this app? how do you instal cydia??????????? Jailbreak that i phone man ! that’s the only way you can install Cydia. Greenpoison/absinthe is the JB you will want to use. I want to install skype in my iphone Iphone 3G IOS 4.1 by cydia. Please help me and email me how can i install skype by cydia. I have a iPhone 3GS. am not able to make any outgoing calls. however am getting incoming calls. what could be the problem? Cydia is just an addition. it’s like a JB version of the app store. Cydia allows you to make the i phone the way it should be by installing tweaks and apps that make it more customizable and functional. I have a boat load of apps & tweaks from Cydia and I have never really had a problem with the phone being slow ( i phone 4 8 GB ). I have heard that ” winterboard ” slows down the phone but I have never really had an issue with it being slow. Just be careful what you install. Make sure you install one tweak or app at a time and make sure it is compatible. if it’s not just uninstall it and move on. once you JB and learn what Cydia can do for your phone you will NEVER want a regular i phone again ! hi i am Using ipod tuch 3.1.3 But How to install installers. What are ” installers ” ? is that something from Cydia ? try to give a full explanation and I will try my best to answer it. do you mean Installous ? the requested modifications cannot be applied due to required dependencies or conflicts that cannot be automatically found or fixed …..
can anyone tell me if after you install sydia and down load pad net can i uninstall syria and still use planet ? hmmmm i’ve got cydia in my mobile but i dnt hav ny idea hw m i supposed to dwnload apps… can i download whatsapp?! nd is it true dat aftr my mobil has been jailbroken it dsent get updated?!! I would like to have mywi and pdanet both but when I install one the other goes away??? cydia has stopped my phone working could you please help me? BUT my power button doesn’t work as new so I cannot put it into off. Can you use Cydia w/o jailbreaking your ipod touch?? Hey how to install Cydia in my Iphone 4s ?? Email me a video please!! Can you tell me if downloading Cydia affects the parental restrictions on the iPod? Is my child going to be able to download any unsensored material? Or are the restrictions going to be working? This has nothing to with cyndia. But since you guys have a lot of knowledge bout apple , jailbreaking and stuffs Id like to ask you on how to install an ios6 to my 4.2.1 ipod4th gen. I dnt knw how to download apps using Cydia pls can u help me??? can i do in iphone 4 /4s in ios 6.1 ?? I upgrade my iphone 3GS from earlier version iOS 4.1 to iOS 5.1.1 and installed skype, fring and viber, but none of them open up when i tap on the icon. How do i solve this problem? Can someone help me please? I installed Cydia on my iPhone 3G , but I can’t seem to update my iOS to iOS 5 or above, and I don’t know how to do it.. Can someone help? Cydia needs root access to run and install tweaks. Therefore, the only way to get cydia is to jailbreak. hello thr..i hav iphone4 n my network seems to b not reachable …somebody told its due to carrier lock can anyone help to remove this carrier lock? I got an iphone 4 from my brother cos he got an iphone 5. He said he had done a jb but wasn’t sure he had unlocked it. So he says I should unlock with the cydia he installed on it (I want to use it with another carrier in another country). The cydia icon has a small 2 on a red round background attached to the upper right side, what does this mean. And when I try clickin it, it doesn’t open. Can anyone help please. I need to unlock my phone! My iphone 3GS was jailbroken and had Cydia installed but now it shows that it has pending updates but when I click on it nothing happens. It says that they cannot be updated so I just left it alone. Shouldn’t it update automatically when I request it to do so? I’m not a tech genius. I don’t even bother to install apps because I don’t want to ruin my phone or lock it…I know I’m not enjoying my phone’s full potential. What would be your recommendation? No. If you were to have any problems though you can just reinstall the Apple software and remove the jailbreak. Just got a 4s and not really happy with it. Wouldn’t it be easier to get a droid or windows phone then go through all this??? 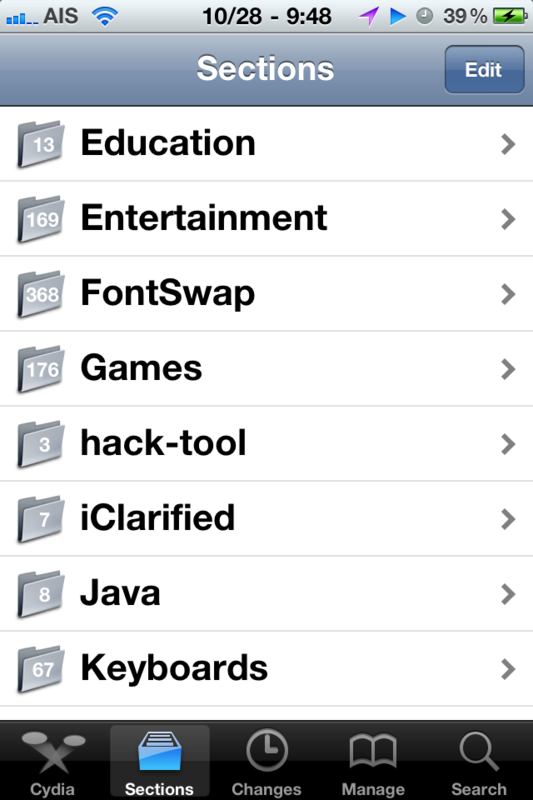 I am not a techie but want all this cydia stuff I have been reading about. I just got the phone so don’t want to invalidate the 1 year warranty though. I have read you can reinstall the apple software. Like I said, I’m not a techie…at least not yet…and don’t want to be paranoid, I just don’t want to get in too deep and not be able to swim. how to install the cydia ?